This is my second post today. For my 12 Kits of Christmas post, please click here or scroll down. My first card today is for this week's Play Date Cafe #159. I was very inspired by Veronica's inspiration card here. I used my new PTI sweater die, and the WPlus9 Fairisle stamp, which always makes me think of warm sweaters. I added that texture to my 'sweater' with the Aida Impression Plate. I have one more card for this week's Make it Monday #93: Splitting Die Cuts. I finally received my November order, and was able to make the first card I thought of when I saw the video, which uses the Circle Border Die and Sentiment Signs. I'm here with the latest edition of our 12 Kits of Christmas. I am having a hard time believing that it is November already. If you are wondering what you have stumbled into, please click here for more information. 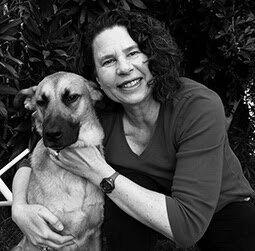 This month's kit was generously provided by Jeanne of A Kept Life. One thing I always admire about Jeanne is how beautifully layered and detailed her cards are. I did try to channel Jeanne when putting my cards together, and she certainly sent enough goodies to play with. I'm not sure how close I got to my goal, as I made 5 cards and my leftovers pile looks almost as large as the original kit. Just take a look at all the goodies she sent. One of the most fun parts about this group is getting to play with stamp sets and dies I don't have, and this month was no exception. I don't think I own a single stamp or die that Jeanne used in this kit. It was so much fun to explore and play with. Well, that's it for me. I've kept you long enough. Now, please head over to see what everyone else has done with Jeanne's kit. I still have a lot left over, and so I am eager to see what everyone else did, and what I can CASE with my leftover supplies. A huge thank you to Jeanne, for putting together such a beautiful, and enormous kit. And, if you have any questions about supplies, just check the list that I'm sure Jeanne will have in her post. Here is a list of the other members of The 12 Kits of Christmas. Please stop by their blogs and check out what they have done this month. Wait--don't go yet--there's more: Serendipity is having a sale--one day only--on 11/30--in honor of our 12 Kits of Christmas posting. Everything Christmas is 20% off. Practically everything used in our posts is from Serendipity, so if you like what you see, head on over to Serendipity and snag some for yourself at 20% off. 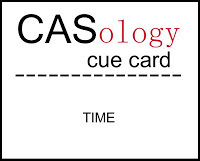 The cue card for this week's CASology #21 is 'TIME'. All I could think about was--Party Time! I don't know why. Nothing says 'party' like balloons, right? 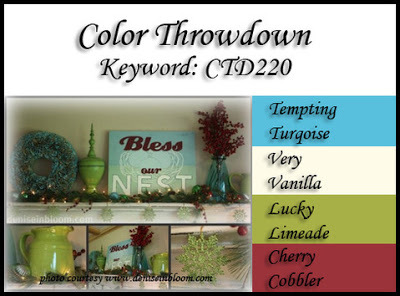 I used this week's Color Throwdown CTD220 colors, which I interpreted as PTI Hawaiian Shores, White, Limeade Ice, and Pure Poppy. And, here is my second entry for this week's Make it Monday #93: Splitting Die Cuts. 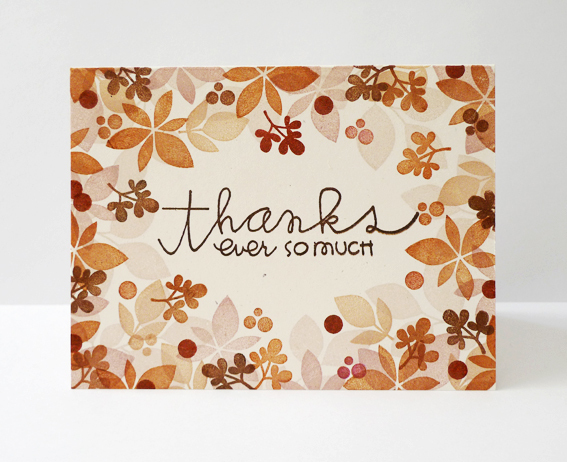 Special thanks to Kim for her inspiring card here. 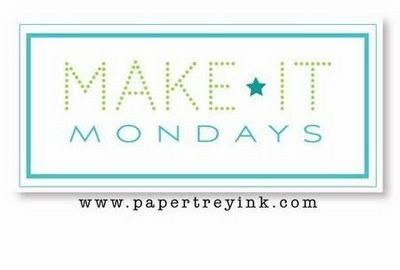 This week's Make it Monday #93: Splitting Die Cuts shows us how to stretch our dies further by splitting up the die cuts. Such a great idea, and I wonder why I never thought of it before. I used the Harlequin Cover Plate and a sentiment from Think Big Favorites to make a get well card for a friend. I added just the narrowest strip of Pure Poppy on either side of the cut pieces of the Harlequin die cut--things looked a little unfinished without that strip. I've got several more ideas floating around in my head, and hope to try this idea again before the week is done. 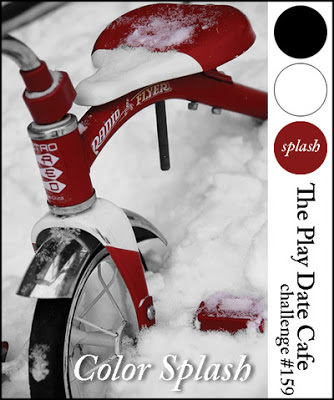 I have a card for this week's ColourQ. 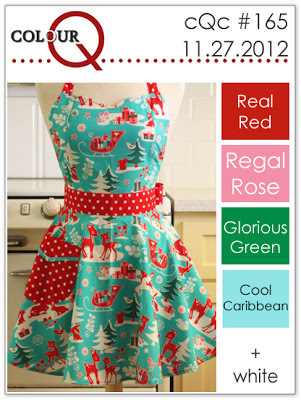 I have to admit that at first I did not see these colors working together at all. But after playing with them, I have completely changed my mind. That penguin is covered in Paper Glaze, which isn't showing up well in the picture. Isn't that just such a warm and cozy scene. 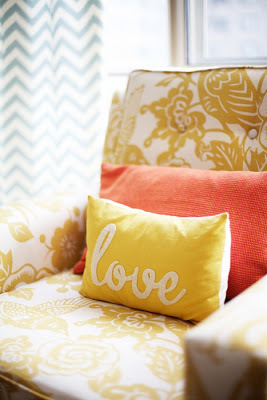 I keyed off the colors--yellows and orange, the love message in white, and the rectangular shape of the pillows. I had to get creative, since my Paper Smooches stash is limited. I used two rectangular graphic shapes from the Alpha Dots set, and stamped a random pattern in various shades of yellow. I used white embossing on Summer Sunrise paper for my sentiment, from Pretty Phrases. My next card is for this week's Waltzingmouse Sketch Challenge WMSC #125--it's been a while since I played in this challenge. 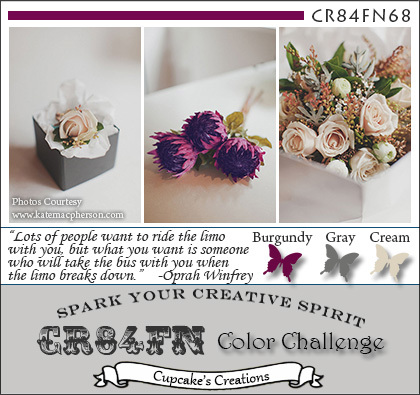 I used the colors of this week's CR84FN68, which I interpreted as PTI Scarlet Jewel, Memento Grey Flannel, and Vintage Cream. I loved how Jeanne used French Country to make her banners, and decided to do the same thing. I wish you could feel that beautiful ribbon--Kim sent it to me--and it is soft as silk. This card, posted by Deb earlier today, really caught my eye. I loved what she did with her Washi tape, and it made me want to do the same thing with some of my tapes. There is a certain someone--nameless--who is trying to get me to buy more Washi tape--but I have decided, for now, at least, to try to use what I have. Crazy talk, I know. This Washi tape actually comes with random sections of different patterns. Quite fun, and they have done all the work for me. By happy accident, I discovered that the chevrons on this Washi tape will all line up when you put the pieces together. And, that the green is a perfect match to Limeade Ice. That's it for me today. Real life is calling my name, and it is hungry! It was great to get back into my craft room, after being away for a week for Thanksgiving. 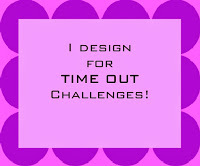 I spent all day today visiting blogs for the Papertrey Blog Hop, and making some cards for this week's challenges. 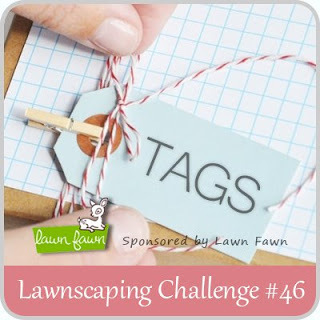 My first card is for this week's Lawnscaping Challenge #46. The challenge was to make a tag. I made a tag and put it on this Hanukkah card for my daughter. I already told her that she won't be getting 8 presents this year, since she just had her Bat Mitzvah and has been inundated with gifts. She thought that was fine, but asked if she could get a card from me every day. Sweet. I know that she will be happy to have this darling owl wish her a happy Hanukah. Incidentally, there are numerous ways to correctly spell Chanukah, but I used the shortest way for this card, because it needed to fit in the speech bubble. My next card is for this week's Case Study Challenge #118. Here is the beautiful sample card from Angeline Yong. 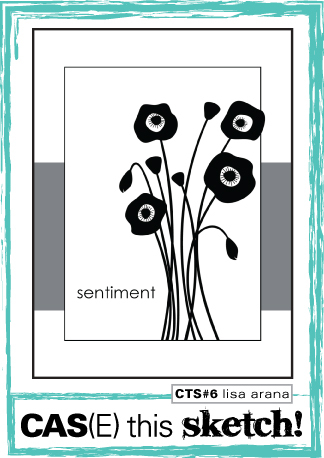 I fell in love with the way this sentiment was surrounded by stamped images, and wanted to something very similar. I used another sentiment from the same Paper Smooches Pretty Phrases set, and surrounded it with images from PTI Sending You in a color scheme of Hibiscus Burst, Summer Sunrise, Aqua Mist, Hawaiian Shores, and Limeade Ice. I also used my newest favorite go-to impression plate, Picnic Plaid. My last card is for this week's CAS(E) this Sketch challenge #6. I have to say, I am really enjoying all the sketches from this new challenge blog. I followed the directions here to make a shaker card using my new PTI Winter Snow Globe set. I used some American Crafts Microbeads inside the shaker, and while they look cool, I think I'll be cleaning up microbeads for a long time. It is worse than glitter, because they roll all over. Not bad for a day's work. I think I must be the worlds slowest crafter. Before I go, here are some pictures of my new paper storage cart from The Container Store. I am using it to store all my PTI paper scraps as well as a supply of full sheets. To save space, I do have some colors stored together. I bought the legal sized cart, thinking that it would give me more space in the drawers below. I love having so much paper and scraps nicely organized and so conveniently located. The cart has two drawers underneath, and I'm not sure what I'll keep there. I have twine and embroidery floss there for now. 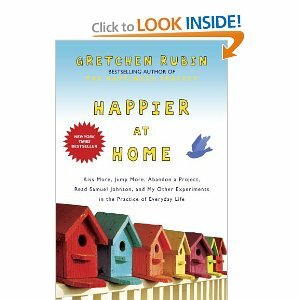 It reminded me of the houses from Love Lives Here, which I had purchased back in July, but hadn't seen much ink yet. My friend Cathy was kind enough to send me the dies, and I based my color scheme on some twine that Kim sent me a while back, and I wanted to use on the card. It's a bit hard to see in this picture, but the red heart on the very end is popped up and covered with Diamond Stickles. Enjoy the rest of the hop. I'm pretty excited to see what everyone else has done. The theme of this month's Waltzingmouse Blog Party is Grattitude, and I have made a Thanksgiving card using a Spellbinders Maple Leaf die and my favorite Plaid Builder set--Pic-nic Patterns. I am also entering this into this week's CASology #19: THANKS.